filled with colored epoxy resin from the front. I made one with enamel (glass), which could be available on commission. Contact Sumner for pricing and timeline for delivery for creating your own unique Greenman II. 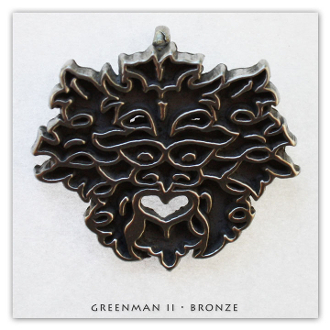 Greenman II is available in solid: Bronze (Yellow), Sterling Silver (925 De-Oxidized), 14k Gold (Yellow) and 18k Gold (Yellow).